After doing quite a bit of reading on the Internet, ok well an afternoon or so, I soon realised that there isn't a step by step instruction for building a roof garden, just lots of greenies saying how good they are, and lots of companies trying to sell you expensive stuff to do it - so i thought I'd give it a go myself. Before putting anything on a roof you need to make sure its strong, very strong. As we'd just had this roof made we ensured we'd had is strengthened - there are 10 joists under the roof, each bolted next to another joist and supported by a steel frame at either end - so its super strong just to be sure. I found online is that living roofs can weight anything up to 150KG per SqM, so I asked our builder and engineer to work to a dead weight of 150KG - whats a 'dead weight' I hear you ask - well.. thats the weight it'll be when there is just itself up there, a live weight is stuff like water (rain), snow or the bloke on a ladder trying to install a satellite dish. All set? Roof ready, then read on! 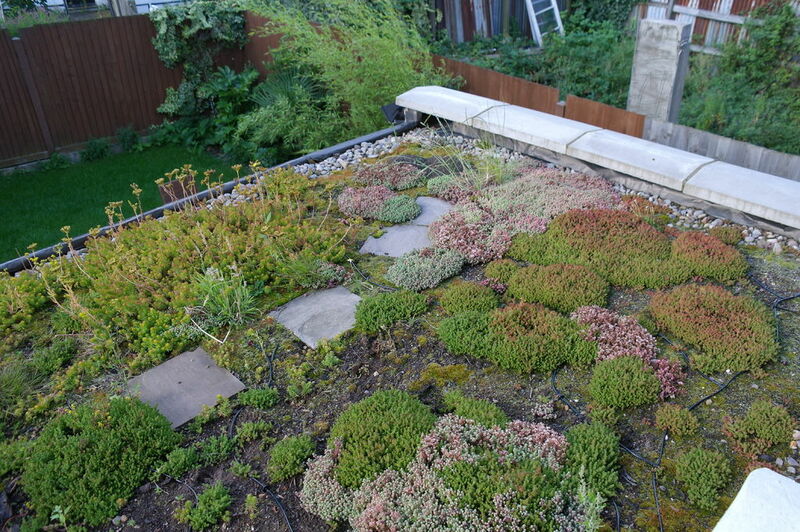 There are a number of types of living roof, ranging from the one I've made (enough for some simple grass, plants and anything else that comes along, right the way to full on living garden worlds, with trees, ponds and more - this isnt what we're after! * - 1 x Roof - it'd be a normal garden if it wasnt on the roof! * - 0 x Insulation - I had to put in some thermal insulation because our council building control couldn't calculate the U value for insulation of the living roof - after installing it this is way better than any fibreglass or fibrespan board - so you probably dont need this! * - 1 x Wood chips - More soil moisture goodness! I started with a fully functioning roof with felt already sealed on it, therefore I havent worried as much as you would need to do if doing this on a leaky roof. The insulation was required by our local building control, but I dont believe this was needed - however if you want a SuperRoof! stick some on it, it cost very little and was the silver backed bubble wrap you get in building merchants. 1. Roll out insulation on the roof and cut to size - nb:/ i did this on a very sunny day (yes we do occasionaly have them in London!) and it was blinding standing on a silver roof! Now onto the soil and compost goodness! Finally moving onto installing the growing stuff! 1. Lay out the bark on the roof - this is another layer of damp goodness to stop the soil drying out too much (when buying the bark make sure its not chemically treated to stop weeds etc, as this will not be good for the plants! We visited the local garden shop and picked up a selection of plants that are hardy (see the bottom of the post for details). Before planting I placed the plants around to get a feling for the spacing. Once the spacing was right then dig a hole and bed them in. All of the plants have now been in for well over a year, sedum really is the way to go. 1. It works - woop! 3. You do need to water it - as I'm lazy I've installed an irrigation system (cost £17 on ebay), this connects to an outside tap, turn it on for 30 mins every few days or so when its very sunny - this could run off a rain water supply if you wanted. 5. We've had bees - which is great! I have built a shed from scratch (to fit in a garden space that a usual sized shed wouldn't fit - 3450mm x 950mm) and I am installing a DIY green roof. It is sloping and I am finding difficulty to source a way of trapping the water - any ideas please? Have you looked into coconut pith/cocopeat? It's supposed to be excellent at holding moisture. It might help you do what you want. Brazil. People really need to know about this sort of thing here! Passive/natural/evaporative cooling is still such an unknown here. Hi, it very nice looks. Great job. Love the layering. Soon you'll be weed-free! how much did this cost you in total? Hey thats great job! Can you tell me the break up of the cost that is needed for different stuff needed for the same. Love it! How long is it since you made the living roof? How are the plants progressing? We are (one day) going to extend and rebuild our back porch (verandah enclosed with screen material to keep out Texas-sized insect life). I would love to make a living roof there, as it faces east, and catches the sun until mid-afternoon. I grew up in Norfolk with the stable roof covered with yellow stone crop, and have dreamt of something similar ever since. Do you live in Islington? Wonderful project. This would be very good on porch roofs. Not surprised that the sedums did well. Very good instructions. Thank you. do you think this would be an option for a chicken coop roof? i think that would be awesome if it was. Cool roof. But being from Minnesota ,USA where winter temps can get to -30f. I have to ask how cold it gets there, that you feel you don't need the insulation? My roof is insulated to R50. it gets pretty cold here these days with snow for a few weeks at least. The reason for not needing it is because the garden itself is such a good insulator. The local government officer could not work out the BTU figure for the living roof so insisted on the additional protection that he was able to calculate for. Looks more or less like every other felt roof after a few years. Only joking, well done, I am sure it will look great in a few years! ....That roof is SUPER strong!! I was just wondering if it could be paved over so you could park your SUV on it? Bahhahahhahha!! !